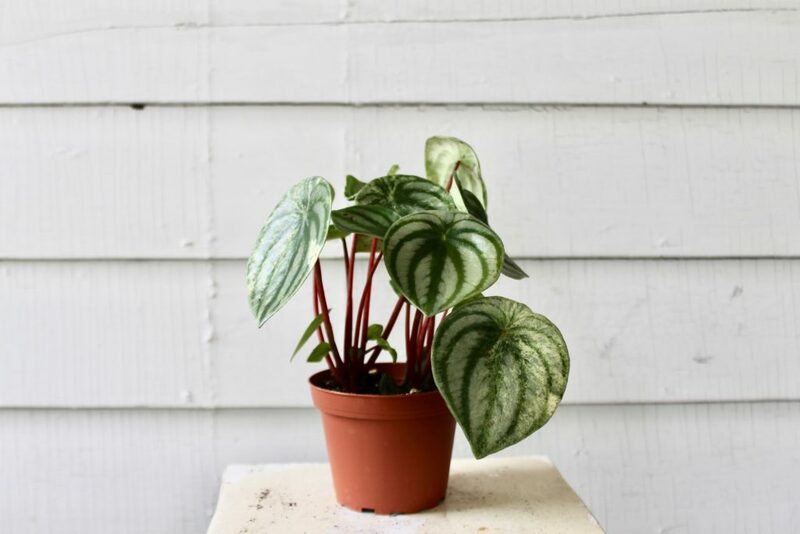 Is your new “it” plant a watermelon peperomia? No? It should be, because they’re awesome and pet safe. We love them at Leaf and Paw – their shiny, almost sparkly unicorn leaves are gorgeous and teardrop shape steal my heart. And what’s better than one watermelon peperomia? Two. At least two. Maybe three. My Watermelon Peperomia, Walter Melon, was getting leggy and crazy, not compact and short as he was initially. 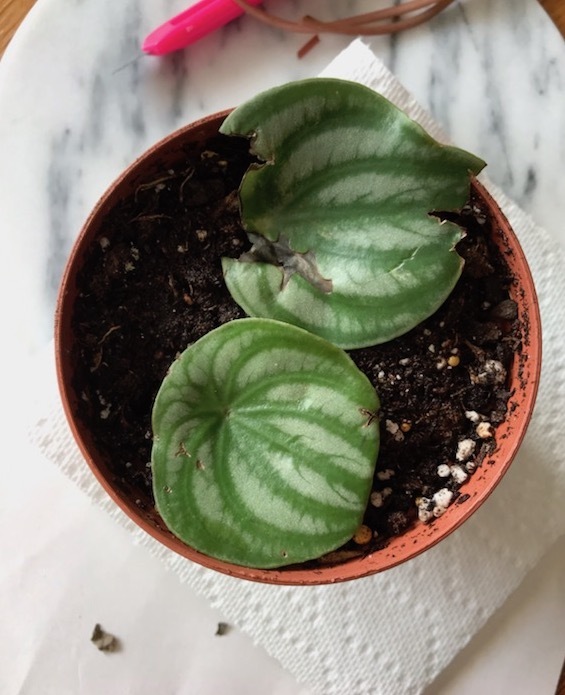 Due to winter in NY and not-the-best plant placement, I was left with a Peperomia Agyreia that needed some TLC. I cut a few leaves and back and thought – can I make a few more Walter Melons? 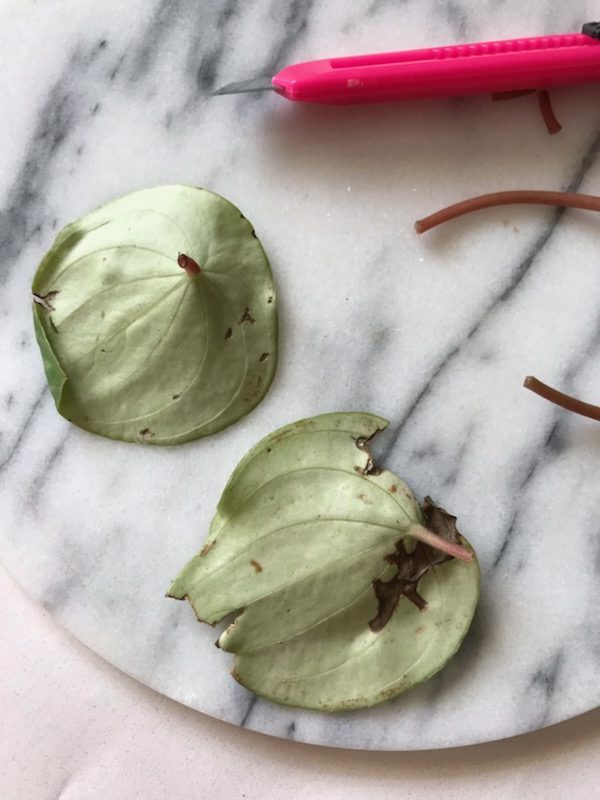 The answer is yes and here’s a short and sweet post about watermelon Peperomia propagation, much like the plant itself. It was actually difficult to find Peperomia propagation tips online, too, so some of this was trial and error. 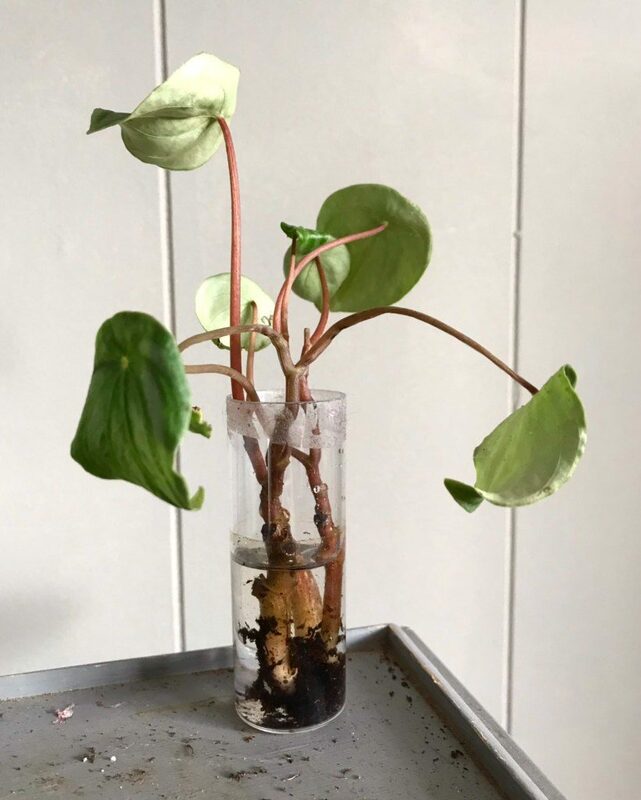 My particular approach works best for Peperomia Agyreia, not necessarily all Peperomia, which is why it needed a post all by itself. In a nutshell, Watermelon Peperomia needs to be cut in a certain way to optimize root development. It’s a little unconventional from your typical propagation procedure. For instance, I typically use rooting hormone on any plant cutting I perform, but not these little leaves. Rooting hormone actually suffocated the stem and didn’t help roots to grow at all, so I left it out. 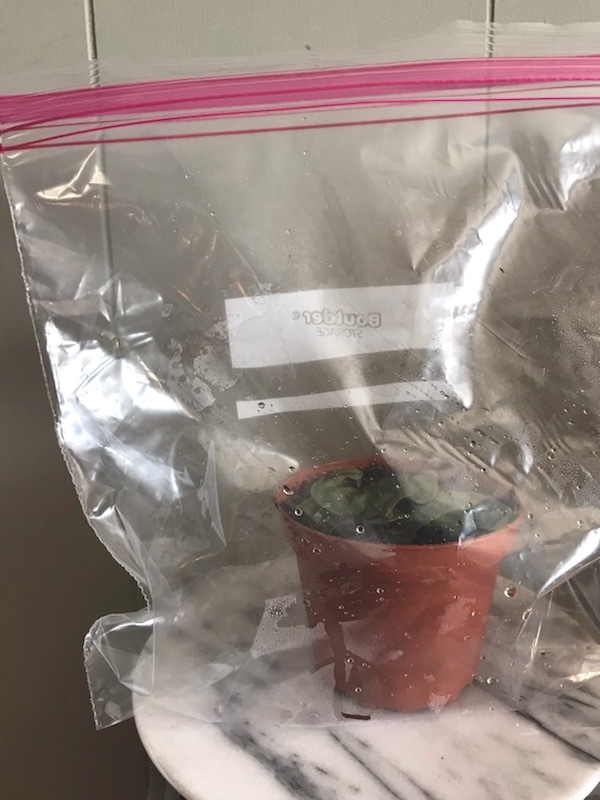 Also, I am keeping my cuttings in a makeshift greenhouse to help with humidity, something that greatly increased healthy roots despite the propagation being done mid-winter in NY. 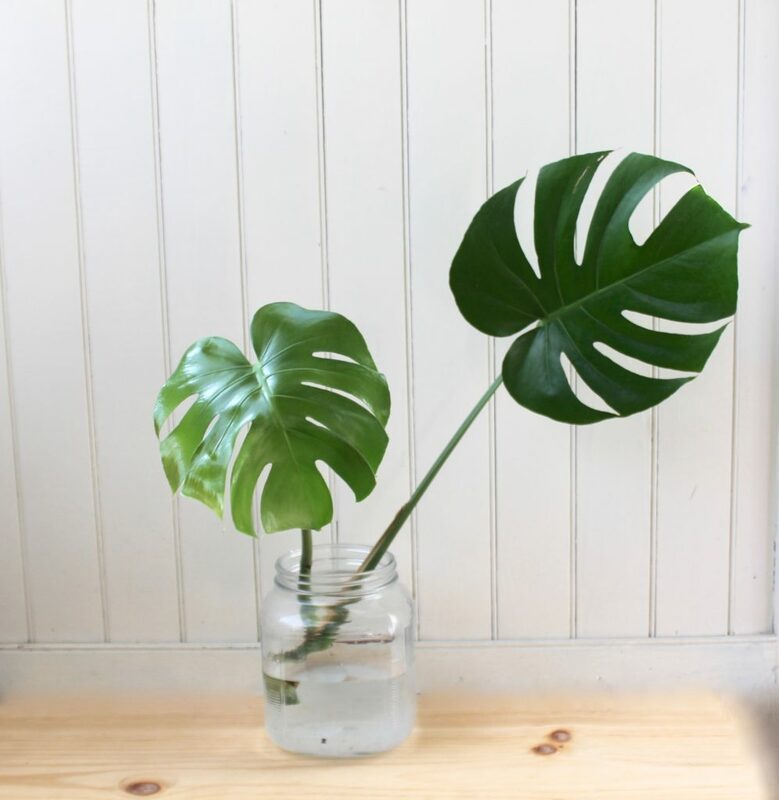 So far, I’ve documented how to propagate Monsteras and Rubber Trees, but if this is your first propagating rodeo with Leaf and Paw, then you’ll need some basic hardware and a stare-down before you get started. 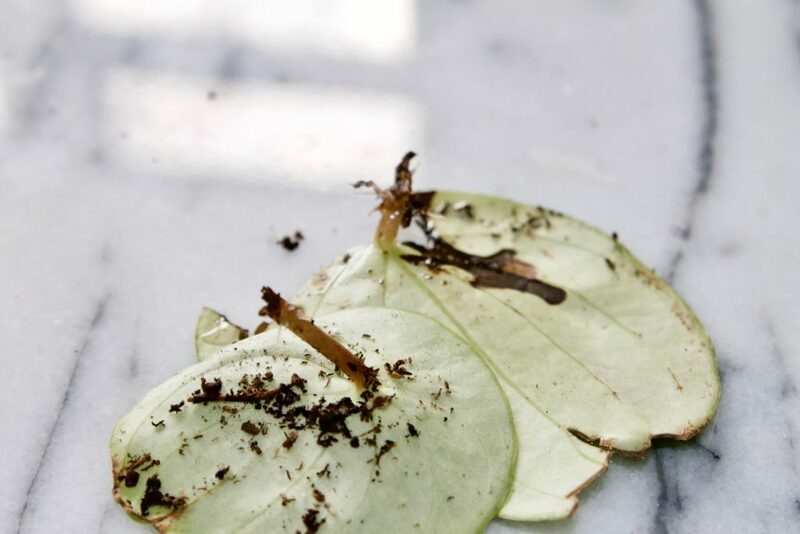 Trying to propagate your plant with any of these issues will lead to tears and heartbreak for you and Peppy. The most important thing with propagating any plant is its health and mental state – you want to be sure both are in the green. -A pot filled with high quality potting mix, moistened. Trim off 3-4 healthy leaves from the Mother plants. Cut at the end of the stem using a sharp, clean knife or blade. The petiole is much too long as-is, so let’s trim it down. I usually cut the petiole in half then again for the length I want. You want 1/4 inch left. Now it’s time to grab that planter with loose and moist potting mix. I used a 4″ pot for two leaves, anymore will crowd the pot. 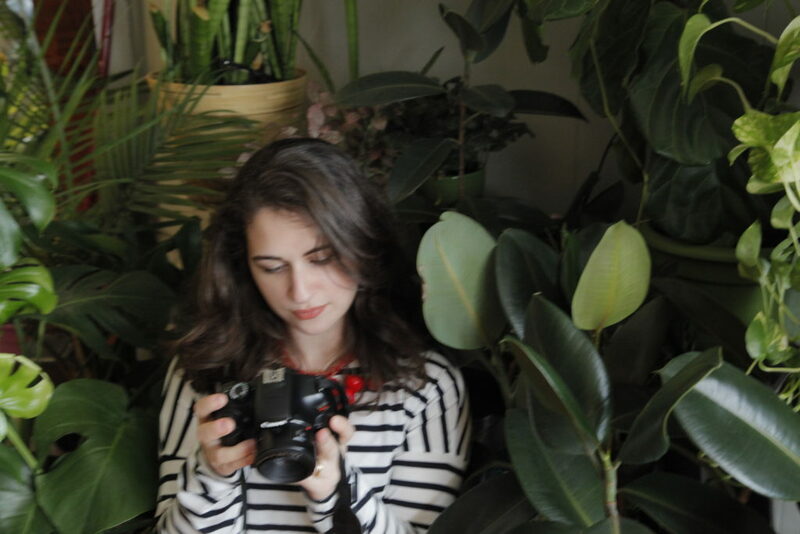 Have more cuttings? You’ll need another planter. Place your glass dome over the cuttings or place the pot in a plastic zip top bag, leaving 25% of the top open. I prefer the dome, but the bag works well, too. The only tricky part is remembering to water them. The bag (naturally) fogs up with moisture and it’s just hard to tell when it’s time to water. Do yourself a favor and just put a reminder on your phone to check the soil every 4-5 days. Keep soil moist and place in a warm location without direct sun. I usually recommend a bathroom window or a south window in a warm house. It’ll take about 4-6 weeks to see new roots. That’s a good sign! They may be tiny but they’re mighty. In another 4 months or so, you should see some leaves. Keep this plantlet in a bright warm spot to make sure he grows up to be the best he can be. 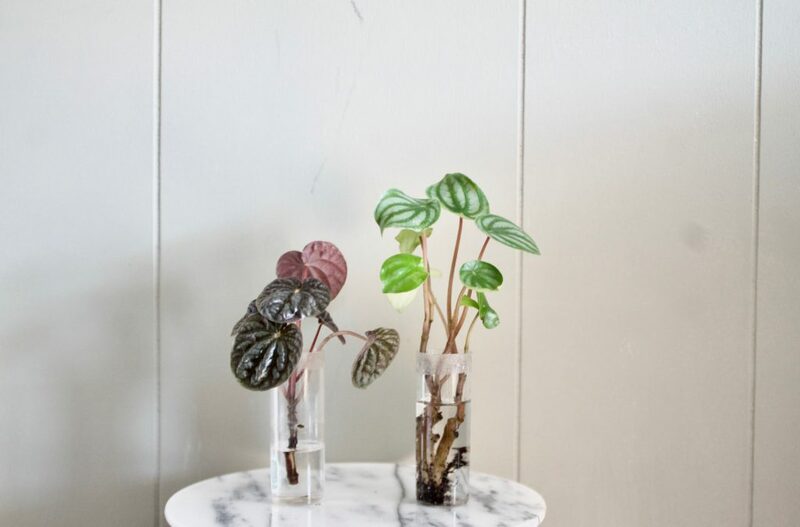 You can also propagate Watermelon Peperomia or any type of Peperomia cuttings in water! 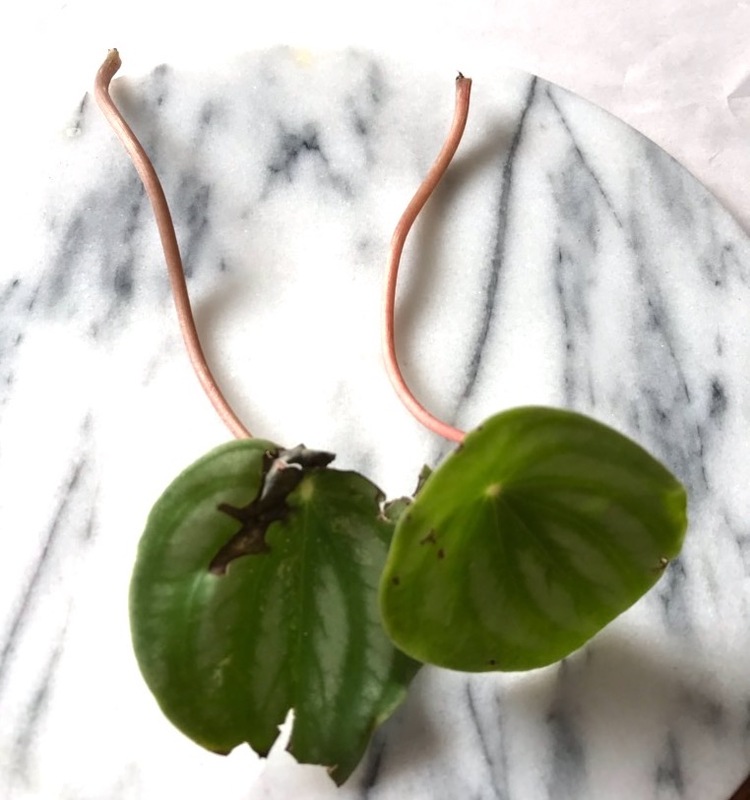 Some types of Peperomia make babies (similar to how Pilea Peps do), which can be cut off the mother plant and put in water to encourage root growth. In addition to the propagation by cutting method, I tried this as well. I cut a small plantlet off of Walter and placed it in a tiny vial filled with purified water (no chlorine, please). After 2 months, I see some baby white roots growing! 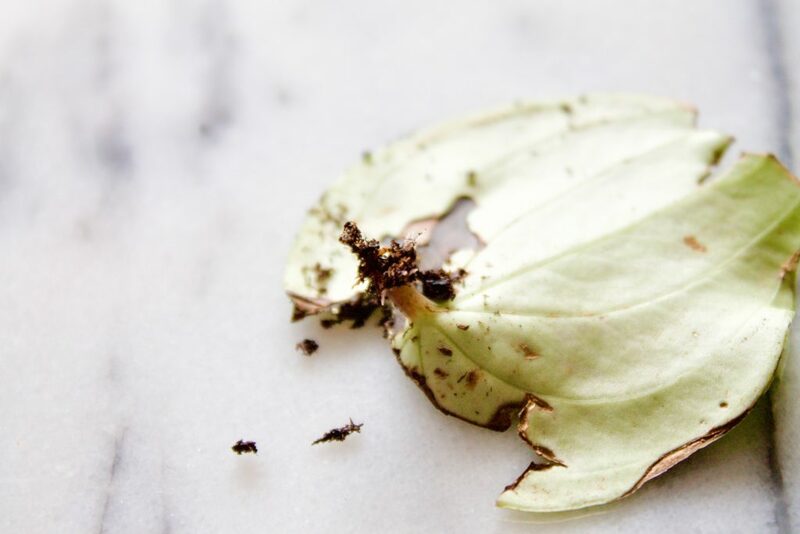 Have you tried propagating your Watermelon Peperomia? Have some questions? Leave a comment! I had no idea that the peperomia family was so varied and prosperous. We just got a peperomia rossa. I love it. Deep green pointed leaves with burgundy undersides and funny little spike blooms, make this a must-have for me. Quick question- watering and feeding the rossa? Also, is the purple waffle plant a peperomia?